The painting Untitled 1959, by Edvins Strautmanis, is executed on a thick cotton canvas with a thick impasto layer of paint. It arrived unstretched and rolled from shipping causing large horizontal cracks in the paint layer that were severely cupping. The canvas support had deformations in relation to these cracks. The canvas is signed on the reverse. The challenge of this treatment was to persuade the canvas deformations to relax into plane, while stabilizing the corresponding cracks in the paint layer with adhesive. First, the heavy grime layer was removed with a buffered aqueous solution on a soft brush and cleared with cotton swabs. The entire painting was then placed on a low-pressure suction table and moistened with water while under pressure. This relaxed the canvas deformations, and allowed for simultaneous stabilization of the cracks in the paint layer through application of a heat-set consolidant. 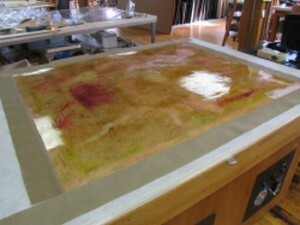 As the canvas layer began to relax from the moisture treatment, the suction table was heated then cooled under pressure allowing the adhesive to set. The result was a canvas and paint layer with dramatically reduced planar deformations. This technique, while not only flattening and securing deformations, also reduced the opportunity of the canvas returning to the deformed state in the future. To add further stability to the canvas layer, the painting was lined to a clear Mylar support and edge lined with strips of linen. Mylar was chosen to allow the inscription to remain visible from the reverse. The painting was then stretched to a custom-built stretcher and paint losses were filled and inpainted. This treatment is an excellent example of employing the low pressure suction table along with the careful use of heat to control the setting of adhesive with the support which results in a more stable paint and canvas layer overall.